I'm posting these for other members. 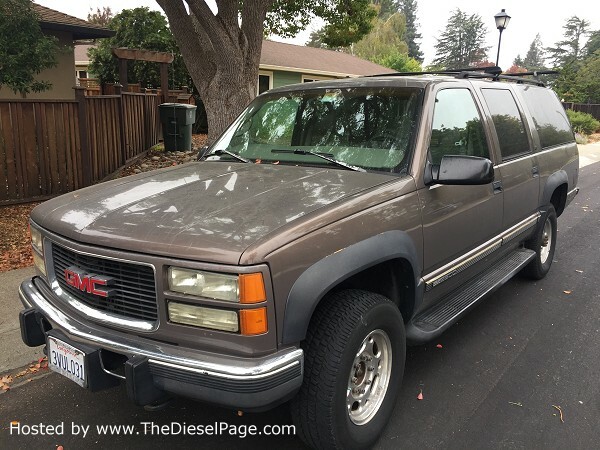 1997 GMC K2500 3/4ton Suburban LS 6.5TD TurboDiesel 4x4 : Located in SF Bay Area, willing to deliver within a 500 mile radius. Northern California car all its life, zero rust, great paint. Fastidious maintenance and upgrades. Runs Excellent. Not perfect, but very fine. Selling due to downsizing. My 3 kids are grown and gone, sniff. Has tow package with 2.5" hitch. The 2nd and 3rd row seats are perfect. The front seat covers and steering wheel cover needs to be renewed. All window motors and locks work. New a/c compressor, dryer but we found a visible hole in a hard line. I acquired this vehicle in 2002 with 65k miles. In the intervening 100k miles, it was maintained fastidiously and improved, including relocated pmd, boost&egt gauges, larger turbo downpipe installed, manual wastegate control, vacuum pump delete, Walbro lift pump with relay off OPS, (easily returned to stock) LED headlights and interior lights. Very recent Bilstein's, front rotors, calipers, hoses, master. Lots of afternoons washing and waxing. Windows, Locks, wipers, etc work. All glow plugs work, engine is fine, turbo spools predictably, 4x4 pushbutton actuators work. Asking $7000. 1983 C20 2wd Suburban: Only 88k sm (statute miles) on this Avant- remanufactured 6.2L (or 6.5) diesel engine. You can drive it home because it's already in a 'burb. No block cracks because its seasoned and inspected before the overhaul; has main cap girders; ceramic coated pre cups and pistons; intake manifold ported to match the factory heads; matched ports; 1-dot precups for best mileage (22.3 mpg in this 'burb); larger air filter housing; burns a quart in 3.3 k miles. A donor truck is included with doors, barn doors, and hood in really good condition to sub-out on this one. Can trade/ exchange for ??? Located in CA. Asking $2,260.